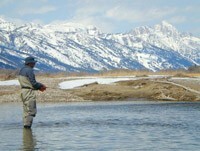 April 1st was traditionally the start of the fishing season in Jackson Hole on the Snake. In 2003 Wyoming Game and Fish changed the winter regulations to catch and release from November 1 – March 31. It still marks the true beginning of dry fly season around here. April is when we see hatches of Baetis and possibly Skwala Stoneflies in warmer years. It truly is a great time to be on the Snake and South Fork as the crowds are minimal and the fish are hungry! Typically the Snake fishes best between Moose and South Park, but the lower reaches are fun, especially with streamers. It’s not uncommon to find a large pod of Cutthroat feeding voraciously, which is well worth stopping and sight fishing to large trout. With lower river flows, shorter floats can take all day, so it is wise to plan accordingly. The South Fork of the Snake doesn’t see quite as much surface activity, but there is some just below the riffles and shallow flats of the lower river. The best game is nymphing, especially below Palisades Dam with Mysis Shrimp patterns, Midges, or Eggs. This is Rainbow trout spawning season and, with the inception of the Angler Incentive program, there is reason to target spawning redds and keep fish. Idaho Game and Fish is trying to enlist the anglers help in removing Rainbow trout from the South Fork since they cross breed with Yellowstone and Snake River Cutthroat. Rainbow trout are a much faster growing fish and native Cutthroat trout populations are diminishing rapidly. This helps the Cutthroat trout and heads of Rainbows contain tags that can be worth up to $1000 if turned in.